Experience a carefree and relaxing lifestyle. Thoughtfully designed with comfort and convenience in mind, our studio floor plans feature a wide array of stylishly efficient and stunningly appointed amenities including stainless steel appliances, white quartz countertops, sealed concrete floors and plenty of closet space. 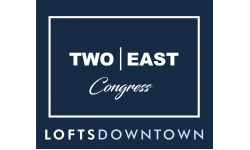 At 2 East Congress Lofts, we offer residents everything they need for a lifestyle of comfort and convenience. Enjoy the rooftop deck with a gas grill and fireplace or fitness center of our sister property 1 West Broadway or community lounge flat screen TV and WiFi at 1 East Broadway. Tour our photo gallery and see why 2 East Congress Lofts is the perfect place to call home! Designed to enhance your "on the go" lifestyle! You'll appreciate our smart design and hip spaces which include our community lounge.